Coach Zelenz and the Gustavus men's soccer team got back on the winning track Sunday with a 3-0 victory over Buena Vista in St. Peter. Mike Butterworth and Ryan Beduhn scored in the first nine minutes of the second half to give the Gusties the lead after going into halftime tied at 0-0. Goalkeeper Trevor Brown posted his fifth shutout of the season making one save. Gustavus improves to 9-2 overall, while Buena Vista's record drops to 3-7-1. The Gustavus men's golf team is in first place at its own Twin Cities Classic after two rounds. The 54-hole event is being played at three courses including the Elk River Country Club on Saturday, the Links at Northfork on Sunday, and the Minnesota Valley Country Club on Monday. The Gusties (289-290--579) currently hold a six-shot lead over MIAC rival Saint John's (294-291--585) with 18 holes left to play. The Gustavus women's soccer team improved its record to 6-5-0 on the season with an impressive 5-0 win over Buena Vista University at the Gustavus Soccer Field on Sunday afternoon. 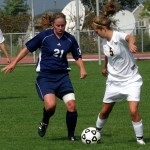 Five different players scored for Gustavus including Jenna Iaizzo, Kristy Tupy, Julien Babel, Ashley Anderson, and Amy Kunkel. Ashley Ohlson and Chelsea Bayer shared the shutout in goal for the Gusties. Gustavus Adolphus College collected titles for both the singles and doubles draws of the Men's ITA Midwest Regional Tournament Sunday in St. Peter, Minn. 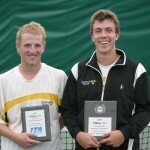 The #1-seed Andy Bryan of Gustavus defeated #11-seed John Kauss of Gustavus 4-6, 6-2, 7-5 to claim the singles title. The #1-seeded doubles team of Andy Bryan and Charlie Paukert of Gustavus defeated the #7-seeded doubles team of Mike Burdakin and John Kauss of Gustavus 5-7, 7-5, 1-0(10-7) to earn the doubles title. Despite a chilly morning in Falcon Heights, Minn., the Gustavus women's cross country team finished seventh with 274 points at the 42-team Roy Griak Invitational Saturday morning. First place team Washington University (MO) had five runners finish in the top 35 to win with 89 points. Senior Laura Edlund (Forest Lake, Minn.) led Gustavus with 21st-place finish in 23:39. Through the wind and the rain, the Gustavus men's cross country team turned in a 16th-place finish with 471 points at the 34-team Roy Griak Invitational Saturday morning. UW-La Crosse won the team competition with 53 points and all five runners finishing in the top 25. 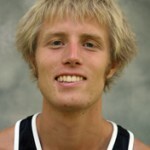 Junior John Leaf (Center City, Minn.) paced Gustavus with a 54th-place in 27:22. Coach Eckheart's volleyball faced another unbeaten conference team for the second consecutive day, and ended with the same result. Gustavus suffered its second straight loss Saturday afternoon to Bethel 3-0 in St. Peter. The Royals finished the match with 62 kills, including three players with at least 16 kills. 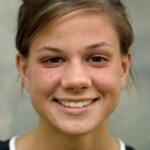 The Gusties were led by Jen Thelemann with 11 kills. Gustavus drops to 11-4 with a 2-2 MIAC record, while Bethel improves to 13-2 and 5-0 in the MIAC. Despite play being moved indoors and outdoors due to weather, seeded players continued to fall in the singles and doubles draws of the Men's ITA Midwest Regional Tournament held at Gustavus Adolphus College in St. Peter, Minn. Saturday. Only two of the top ten seeds advanced to the semifinal round of singles play, while a Gustavus doubles team is guaranteed to win the doubles draw. The Gustavus women's soccer team suffered a disappointing 2-1 loss to Carleton on the Gustavus Soccer Field on Saturday afternoon. The Knights scored one goal in the first half and one in the second half to build a 2-0 lead, before the Gusties cut the lead to 2-1 on a goal by Ashley Anderson in the 84th minute. 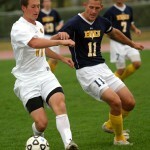 Gustavus pressured the Knights late in the match to try and tie the score but could score the equalizer. The Gustavus men's soccer team saw its five-game winning streak come to an end with a 2-1 loss to Carleton Saturday afternoon in Northfield. 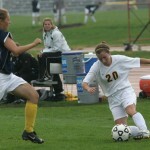 Carleton scored two goals in the first half to give the Knights a 2-0 lead they would not surrender. The Gusties got on the board in the second half with goal from Mike Butterworth. Gustavus falls to 8-2 overall and 4-1 in MIAC play. Carleton improves its record to 8-1-1 and 4-0-1 in the MIAC.